This is the most important part of the sign. If you begin with an inferior product, you will have an inferior sign. While Capitol Design primarily works with cedar and high-density urethane (HDU), we also manufacture with tile, glass, brick, marble and granite. All cedar is clear heart, kiln dried, vertical grain. The clear heart has the fewest knots of any grade and contains the tannins that provide natural decay resistance. The kiln drying controls the moisture content to prevent warping. The vertical grain (perpendicular to the sign face) allows for the desired dimensional or ridged effect that is the trademark of quality, sandblasted signage. We buy our lumber “in the rough” and surface plane in-house to assure maximum thickness to all of our signs. Our high-density urethane is typically 15 pound density. This material is extremely durable and with the “Grain Fraim” used while blasting, can duplicate the look of vertical grain redwood. Used without the “Grain Fraim”, the background resembles stucco: typically HDU is used for extremely intricate graphics such as seals. 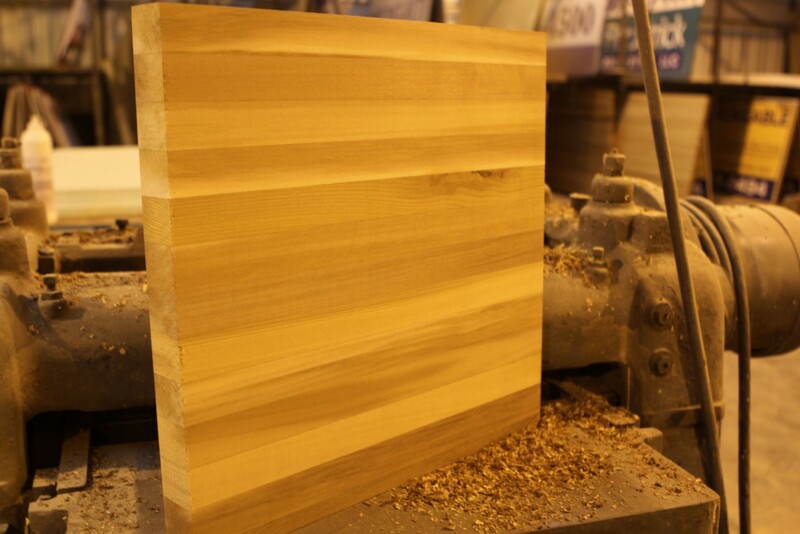 The vertical grain cedar is used full length to insure a continuous grain. You will never see a finger joint in a Capitol Design product. We use one part Sign Life adhesive, considered by many as the best in the industry. Our HDU panels are cut to size from 4’x8′ sheets. When glued, we follow all manufacturer recommendations. All blanks are glued and clamped for a minimum of 24 hours. After gluing, the blank is then sanded and cut to shape by our master woodcrafters. We can produce signs from your design. We have import capabilities from most graphic and sign making programs. We can also scan your designs. Capitol Design offers full in-house design services. If you can sketch your idea, we can transform it into a custom crafted, sandblasted sign. Plus we can provide design drawings for your customer. Completed designs are then cut into stencil and applied to your prepared blank by our layout specialists. Our expert sandblasters match the grit and adjust blasting pressures to the substrate and to the level of detail of the sign, in order to provide neat, clean edges to the blast. We can achieve the highest level of detail with the HDU substrate. The typical blasting depth is approximately 3/8″. This may vary somewhat based on the hardness or grain width of the redwood. Special effects such as “stage blasting” are used to produce even greater dimensional effects. After blasting, the signs are stripped of the stencil and sanded in preparation for painting. All painted signs are primed with Chromatic One Shot “block-out” prior to application of background colors. Only top quality enamels and latex paints are used. Specialty lettering enamels are used for all copy and logos. A minimum of two coats of background color are applied, with hand sanding between applications. Gold Leaf Gilding is professionally applied using the highest quality leafing materials (gold, silver, etc.). Our proprietary treatment to blasted HDU can produce a “cast bronze” appearance at a fraction of the cost. Smaller packages for UPS/Fed Ex shipment are wrapped in multiple layers of bubble wrap, with edge protectors, and then in cardboard for maximum protection during shipment. Our larger, “over the road” shipments are custom packaged in crates designed by a structural engineer to withstand the toughest freight company abuse. Breakage has been virtually eliminated.